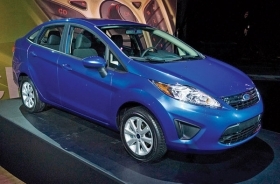 Ford will offer sedan and hatchback versions of its Fiesta in the United States. LOS ANGELES -- The Ford Fiesta and Mazda2 are two budget cars on the same platform, but Ford and Mazda still labored to differentiate them. The cars have different engines, lengths and sheet metal. Ford will offer a sedan and hatchback in the United States, while Mazda will sell only a five-door. Mazda also sells a three-door in Europe. The two vehicles made their world debuts in U.S. trim last week at the Los Angeles Auto Show. Both got redesigns for Europe in 2008. Each brand's variant carries its own parent company's engine. Despite Mazda's "zoom-zoom" marketing, the Ford engine is more powerful and features variable camshaft timing. Ford also is debuting a six-speed, dry-clutch automatic transmission here, mostly because the European market prefers stick shifts, said Steve Pintar, Fiesta chief program engineer. Despite Mazda's "zoom-zoom" marketing, the Mazda2, shown, has a smaller engine than its Ford sibling. The Fiesta is 4 inches longer and an inch wider. This is mostly because the Mazda2 has shorter front and rear overhangs, giving it a stubbier appearance. Both vehicles have standard 15-inch wheels; a front-disc, rear-drum brake setup; a MacPherson strut front suspension; and a torsion-beam rear suspension. Suspension settings differ. Robert Davis, Mazda North American Operations senior vice president of product development and quality, noted that "all the expensive stuff is shared ... the crash structure, the fuel system."